Revamp your home and garden with one of our stunning conservatories, and add extra living space for versatile use. Get warm and cosy conservatories that are well-insulated and stay warm with lower energy consumption. Our conservatories are durable and sturdy, with added security measures so that your home stays safe and secure. Create the perfectly tailored look for your conservatory to fit your Bishop's Stortford property as well as your taste. Get conservatories at amazingly affordable prices, especially considering the great features they provide. We are reputed and reliable installers of uPVC conservatories in Bishop’s Stortford. Our quality of work and product is evident from the reviews we receive on Checkatrade and Which? Trusted Trader. Moreover, we are fully accredited and Trading Standards approved. As a result, you can be sure that your stunning conservatories will be installed according to the most stringent standards. At A&A Windows, we work hard to give complete customer satisfaction. As part of this endeavour, we give you free design, no-obligations design service. We will help you visualise and actualise the conservatory of your dreams. What’s more, because of our experience we will be able to tell you what will and won’t work. As a result, you will not waste time or money pursuing impractical conservatory ideas. Getting a conservatory installed in your home can be a disruptive and stressful exercise. You may be overwhelmed by the amount of planning required and the unexpected obstacles. This is why we assign a project manager to take care of the planning for you. The project manager ensures things move smoothly and according to schedule. As a result, the process is not as taxing for you. In order to give you greater satisfaction, we offer a host of styles in our conservatories, including a range from Ultraframe Conservatories. As a result, you have more options and are more likely to get the perfect extension for your home. We offer lean-to, Edwardian, Victorian, and Gable conservatories. Additionally, we also provide customised shapes like P-shaped, L and T shaped, and even sunlounges. Furthermore, you can choose to have dwarf walls, uPVC panels or fully glazed panels, as per your preference. We offer conservatories that are guaranteed to look good. We offer some exquisite styles as well as roof options. Moreover, we ensure that the design you pick blends well with your home. 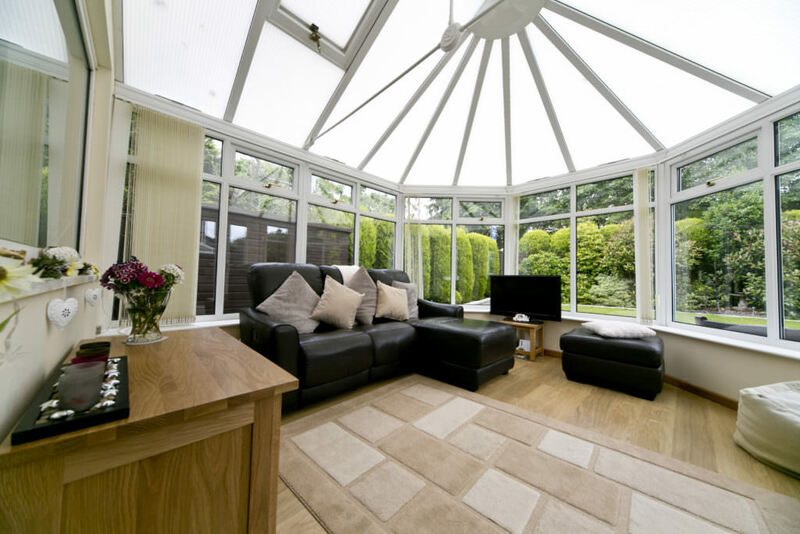 As a result, your conservatory looks like a seamless part of your property. What’s more, we install these conservatories with just the right fittings, doors, and windows, so you get a stunning addition to your home. One of the best things about our uPVC conservatories is how easy they to care for. You just need to wipe them with a damp cloth and that’s all they need. The colour of the frames does not fade like with wooden frames. Moreover, the paint does not peel, chip, or flake. These durable conservatories are so easy to maintain that you won’t even feel the effort. Our durable conservatories are so robust that they seem to suffer no damage from the elements. The colour and appearance remain almost as good as new in spite of the constant attack of the elements. What’s more, we make sure you get a proper seal on them when we install them. As a result, you can enjoy them no matter what the weather outside is like. No matter how gusty it is, you will not get any draught or even water seepage. Our uPVC conservatories are innately quite strong. Moreover, we give you engineered frames for a more seamless fit. As a result, they are virtually tamper-proof. In addition, we fit them with security fittings and multipoint locks. As a result, these conservatories act as a deterrent for even the most stubborn intruder. This way, you get better protection for your home and family. Heat leaking out from your house is the largest contributor to your energy bills. You spend more energy in keeping your home warm. However, with our uPVC conservatories you get better insulation. As a result you don’t have to spend as much power heating it up. Even when you turn off the heating, your conservatory is guaranteed to keep itself warm and your bills low. To get some of the most attractive conservatory prices in Bishop’s Stortford, simply utilise our online quoting engine. This handy little tool lets you enter your specific requirements and then uses them to calculate your cost estimate. Alternatively, you can contact us to learn more about our conservatories and installation services from our team of experts. Someone from our team will be happy to help you!